This article was written for extra credit by a student in my virology course. Recent research has suggested a new method of flu prevention and treatment: the administration of granulocyte macrophage-colony stimulating factor (GM-CSF) to the lungs of mice significantly reduced flu symptoms and prevented mortality after a lethal dose of influenza virus. GM-CSF helps the body defend against the virus by boosting the presence of alveolar macrophages (AM), which are essential parts of innate defense. Currently, there are two main methods of flu prevention and treatment: vaccines and antivirals. Vaccines work by priming the adaptive immune system against antigens in the virus from the preceding flu season (specifically, hemagglutinin and neuraminidase). They are, however, limited by the frequent genetic mutations in the influenza genome that cause antigenic drift, which in turn reduces vaccine potency. Additionally, an individual exposed to the virus not long before or after vaccination may still get sick. 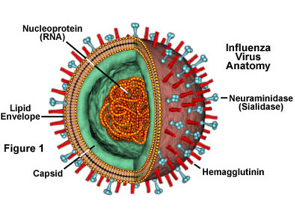 Antivirals for influenza mimic sialic acid, which is a natural ligand of neuraminidase, and effectively prevent newly-created virus particles getting “un-stuck” from the cellular membrane. However, in order for antivirals to be effective against flu, they must be administered within 48 hours after infection. Further, the efficacy of influenza antivirals, such as in the case of Tamiflu, can be reduced by drug-resistant strains of the virus. In the experiment, several mice were treated with GM-CSF for a week before infection with influenza virus, and immune response, amount of virus in the body, and lung tissue damage were all measured. It was found that elevated presence of GM-CSF in mouse lungs conferred significant protection against lethal influenza infection, and that pulmonary injury was also reduced. GM-CSF acts by increasing AM presence in the lungs, and this helps to develop a faster immune response in the host. GM-CSF therapy has several advantages over current methods of dealing with influenza. Unlike vaccines, GM-CSF does not rely on the body being able to mount an adaptive immune response to the virus, and treatment is not strain-specific. Mice in the experiment were first infected with PR8 H1N1, a laboratory strain, and in subsequent trials with three other strains (H3N2 HK68, and mouse-adapted H1N1 California/04/09 2009 pandemic strain). GM-CSF in the lung protected against all of these strains. The results of the tests were also unambiguous: every SPC-GM mice, which only expressed GM-CSF in the lungs, survived, while all the mice expressing no GM and the wild type mice died. Additionally, it is unlikely that viruses will develop immunity to GM-CSF, which presents a constant problem in antiviral treatment. There were also general benefits to GM-CSF therapy. One was less collateral damage: while inflammation on the first day of infection was higher in SPC-GM mice than in wild type ones, it began to resolve after six days in SPC-GM mice, while the effects could still be seen in the non-mutated mice. Uncontrolled cytokine release was also limited in SPC-GM mice, minimizing tissue damage, and the augmented production of cytokine IL-20 at latter stages of infection helped to further tone down pulmonary inflammation. The study suggested that the SPC-GM mice had a more rapid immune response. Additional analysis of lung tissue and virus content proved that the presence of GM-CSF led to less mortality and lung damage than in the case of regular mice. The study also demonstrated that alveolar macrophages are essential for conferring resistance to influenza for mice, and that they were most critical in the first three days after infection. This short window of maximum AM efficacy (and therefore GM-CSF efficiency) brings up the problems associated with, for example, TamiFlu: will animals (especially humans) be able to get them in time after noticing flu-like symptoms? Additionally, we have to recall that GM-CSF was given to mice before infection. It is therefore also necessary, as the scientists behind this report noticed, to evaluate whether dosing after infection will be equally, if at all, effective. In terms of the high variability of virus antigen, while four strains were tested in this study, it is still uncertain whether it will be effective for many other kinds of influenza virus present in the world. Finally, it should be noted that highly lethal viruses were used here, while humans tend to be infected with milder strains of flu; the experiment therefore may not be entirely applicable. In all, while this is a very promising finding that takes advantage of a therapeutic pathway not previously studied, much work remains for scientists before GM-CSF can be evaluated for its potential therapeutic use in humans. Great article. My questions would be if we already have a test to measure AM presence and/or activity in humans? It would be very useful to have some markers for an individuals “viral immune defense” in order to know who could benefit most from preemptive treatment or to know whos risk for catching the flu is higher than average. GM-CSF seems to play a role in MS, so it still has to to be determined if longterm treatment in humans is appropiate. From what I understand, if one were to begin clinical studies of GM-CSF in humans for this purpose, broncoalveolar lavage (BAL) could be used to consider levels of human alveolar macrophages (HAM) in the lungs of subjects, since it allows one to determine WBC counts. Of course, the process has its own limitations – there are really big ranges for normal counts, so I think the numbers themselves would give us a good idea of who will be more susceptible to catching the flu. However, it might be a way to monitor levels of HAM with the new potential therapy. That being said, this is more of an educated guess on the subject than anything else. I didn’t know about its role in MS; a quick google search also seems to implicate it in arthritis to some extent. I haven’t had a chance to read over the paper to which you linked, but I’ll try to get to it this weekend. I do wonder if the method of administration could mitigate its negative effects, or whether it would cause potentially severe side effects anyway. Even if GM-CSF has implications for MS, it still is not clear whether short term treatment with GM-CSF has strong negative effects or if it has any negative effects for non-MS people at all. Neutralisation of GM-CSF in mice cured MS but I’m quite sure that the neutralisation of GM-CSF could also cause detrimental side effects like maybe increasing risk for viral infections. Anyways, thanks for your article, my comment was only based on some speculation.